The Basic Level Program includes approx. 270 hours of classes and two individual advising sessions over the course of two years. 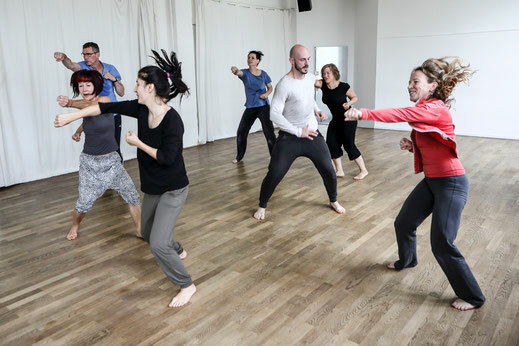 During the Basic Level your understanding of movement will be enhanced by practicing and experiencing the different Laban/Bartenieff Movement Studies perspectives. In the first year, the focus is on the practical and theoretical study of the Bartenieff Fundamentals bodywork (Basic six sequences, body connectivity and whole-body organizational patterns). In the second year, the emphasis is on the practical and theoretical study of the Laban Movement Studies (Space Harmony, Effort & Shape theory and Body Actions). Movement observation and notation (including methods of observation, observation exercises and motif writing). Seminars on anatomy, history and application of Laban/Bartenieff Movement Studies. In the time between the blocs homework will be done independently. Once all the assignments, the movement and written evaluation at the end of each year, are complete, then the certificate Basic will be awarded from EUROLAB e.V. With this certificate, the acquired knowledge can be applied in your own professional field.